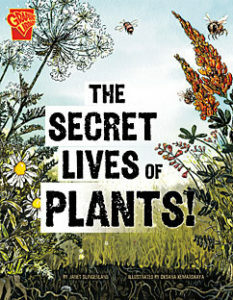 This graphic-novel style science book is packed with information about plants from photosynthesis to reproduction. This title was picked as one of the Top 40 (or so) 2012 YA nonfiction titles by the Pennsylvania School Librarians Association. "…a must read for anyone researching plants and their life cycle. Do not be fooled by the size or format of this book; it is a valuable resource. Believe or not, there is a World Carrot Museum. They have a bunch of fun experiments and activities to try using...you guessed it...carrots! The awesome Exploratorium has an interactive site dedicated to the Science of Gardening. If you like detective work, check out the Great Plant Escape, a game for 4th and 5th graders made by the University of Illinois. For a list of videos, games, and experiments relating to plants, check out Science Kids. The American Chemical Society has a list of plant experiments for a variety of ages. Discovering Photosynthesis was brought to my attention by a student researcher. It's got some great information about photosynthesis, as well as links to other sites and videos on the topic.